A beach with black sand ?. Wait a minute – This was my first reaction when I heard about black sand beach in Big Island. I just resisted my temptation to not see any pictures about black sand beach in the internet until my trip and wanted to enjoy the whole experience seeing it in live action. Hawaii’s Big island is well known for it’s white, green and black sands mainly due to the frequent volcanic activity in this island. Punaluu Black Sand Beach is one of the most famous black sand beaches in Hawaii that is located on the east side of the southern tip of the Big Island. This beach is on the way to Hawaii Volcanoes National Park and is only 1 hour past the entrance to the volcano park. It is easily accessible from Highway 11 between mile markers 55 and 56. 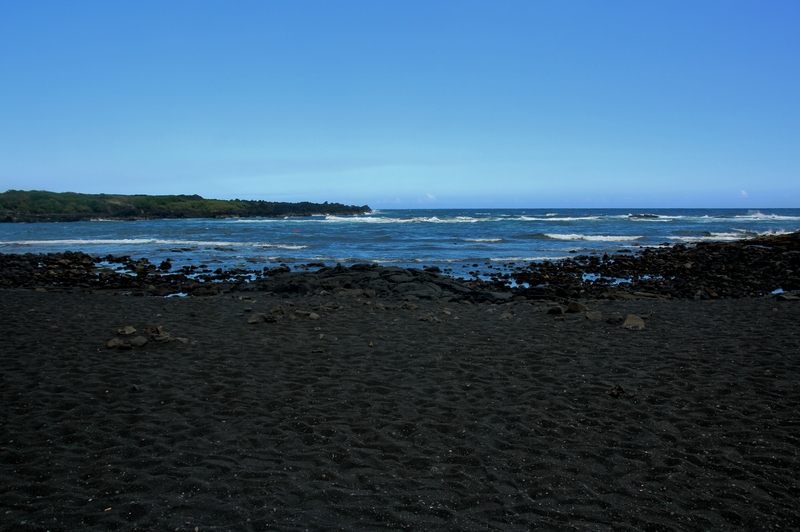 It is the most expansive and easily accessible black sand beach on the Big Island, and great for swimming, snorkeling, coastal hikes or a nice picnic. 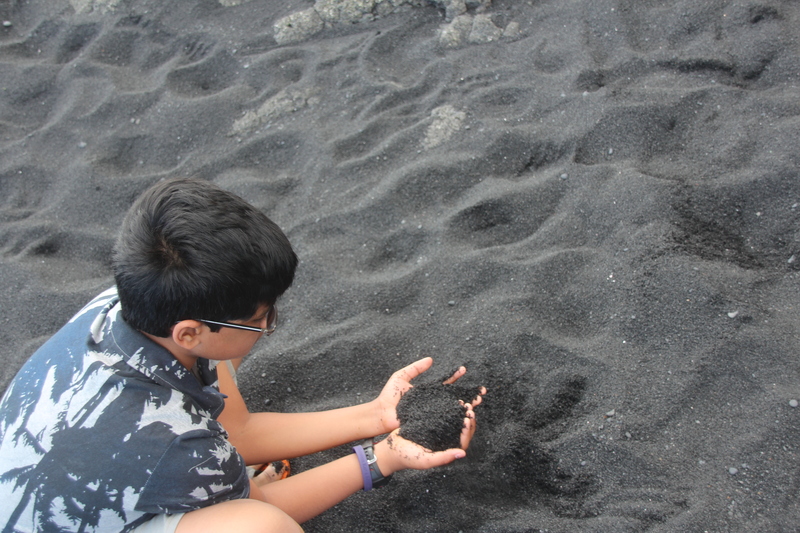 The black sand is made out of tiny fragments of lava. Most of the black sand is created when hot lava enters the water and cools down so suddenly that it solidifies, and breaks into large quantities of ‘black sand’. 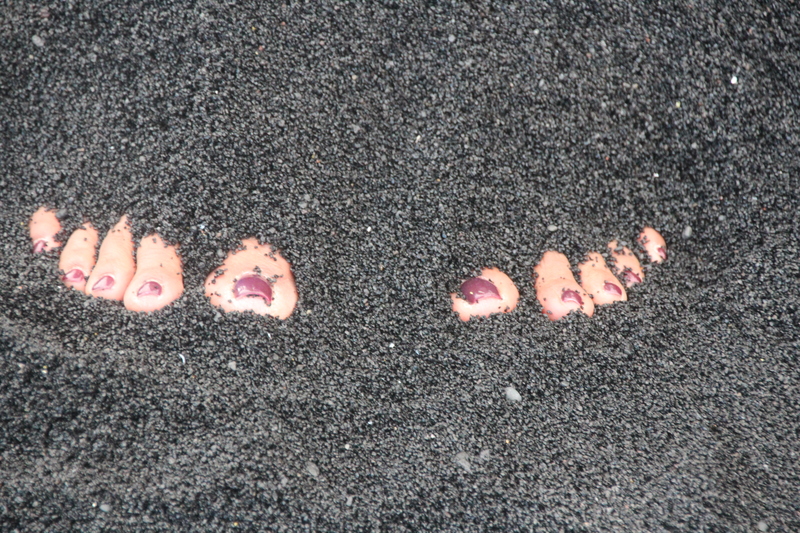 When you walk on the sand, you will notice the warmth and moisture retained by the black sand. Punaluu beach park not only offers a beautiful beach and ocean entry but also a small freshwater lagoon full or tadpoles and fish. This beach almost guarantees the sightings of the endangered turtles. We spotted close to 7 turtles while we were there in the location. 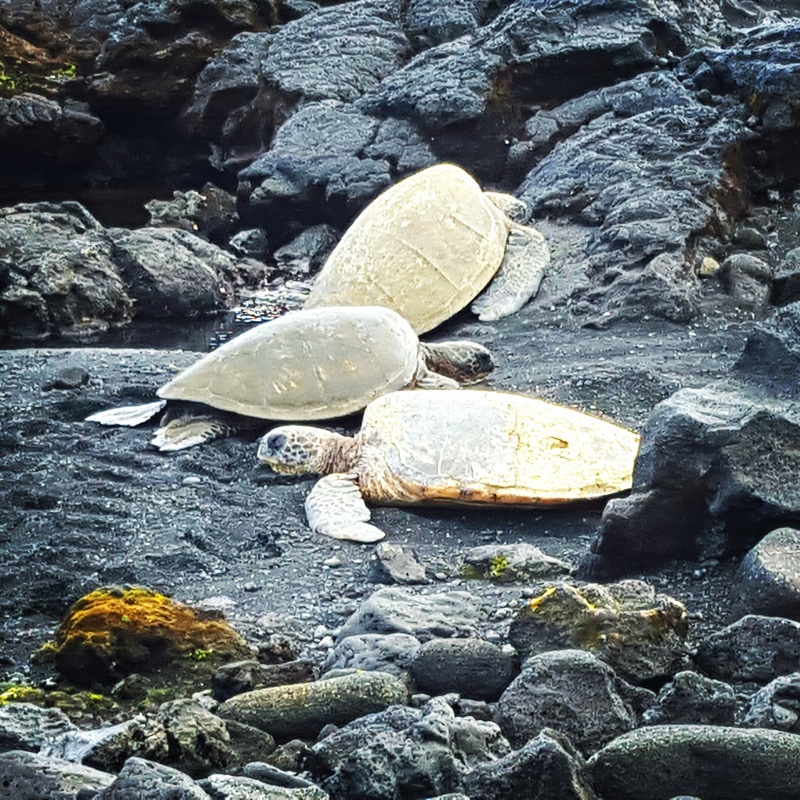 Hawaiian green sea turtles take part in a turtle activity called basking, where they simply lie on the black sand and absorb the sun. You will see sign boards to not disturb the turtles and is considered illegal to attempt any touching or playing with these turtles. It was great to soak my feet in the black sand ! These beaches are not your typical Hawaiian beach experience, but they are unique, memorable and well worth checking out while you’re on the Big Island. As this beach is on your way to the volcanoes, it is worth your visit to spend few hours to experience the bold beautiful color of this beach park. 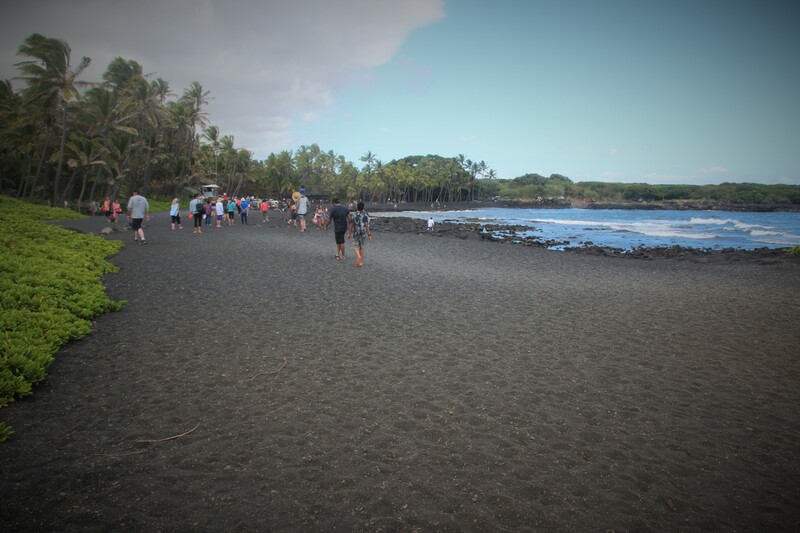 4 Responses to "Black Sand Beach – Big Island"
When we visited Hawai in 2014, we saw this beach.. Truly a wonderful phenomenon of Nature! Thank you Mr.Sreedhar for your comment !. Nice to know that you have visited this place. Thank you Sriram and Krithiga for your comments !. Glad you liked it.